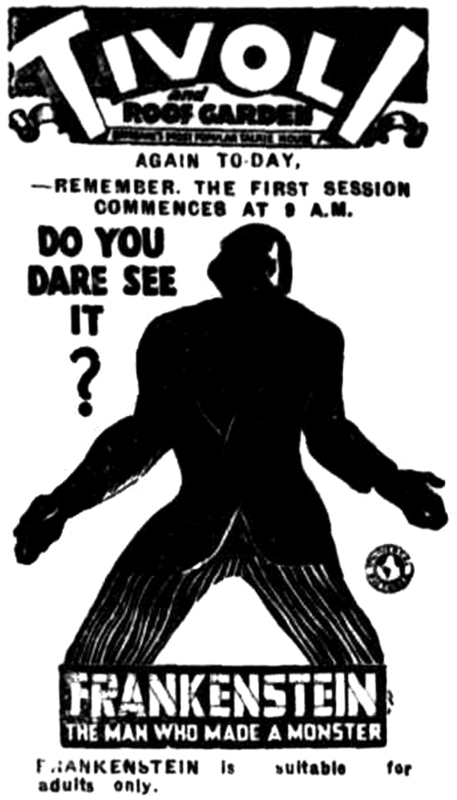 The Monster in dramatic silhouette dares Brisbanians to see Frankenstein, June 1932. They responded in droves. As the film played its weeklong engagement at the Tivoli, the management kept the ballyhoo on high, running a different newspaper ad every day. 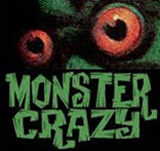 Another oft-used slogan for the film, The Monster is Loose!, accompanies a photo of Mae Clarke's bedside swoon. 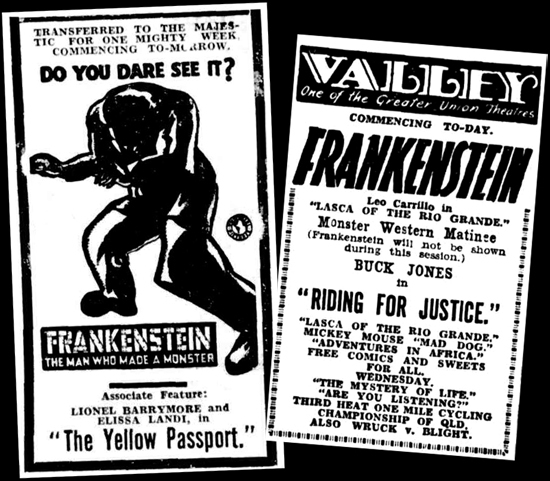 Frankenstein was pronounced “The picture that is making Brisbane sit up and take notice” and, indeed, its showing at the Tivoli was immediately followed by a stint at the Majestic, and then on to a third week at the Valley. Opened in 1915 as a Vaudeville house, the Tivoli was a unique twin theater. The lavish, main auditorium held 1800 seats and the Roof Garden sat another 1200. The cold air plant inside and the roof theater's large awning with open sides made the Tivoli “the Coolest Theater in Australasia”. Repurposed in 1927 as a cinema, the Tivoli was then billed as “Brisbane’s Most Popular Talkie House”. It would fall to urban renewal in the late Sixties. 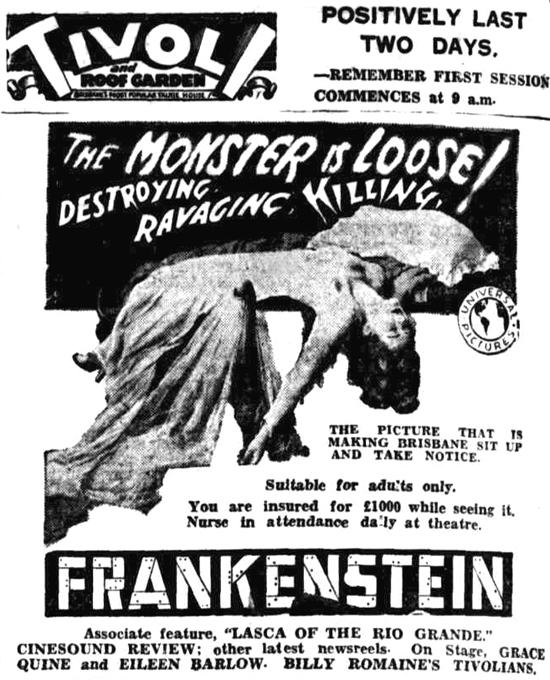 By the time Frankenstein played Brisbane, the film was already a top box-office draw. As we’ve seen over this series of posts, the PR people at the Tivoli, with bold ads and even an in-person Frankenstein appearance, made sure that everyone knew that The Monster was in town. In weeks to come, we’ll visit other towns and enterprising theaters all over the world where Frankenstein was rolled out in style. I see that the Majestic Theatre doubled FRANKENSTEIN with THE YELLOW TICKET which features Boris Karloff in a quick one-scene role. Nice catch, Rick. 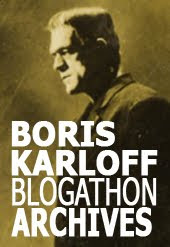 Bound to happen, as Karloff appeared in 24 films over 1931/32. Digging through old newspapers, I’ve spotted many an occasion where FRANKENSTEIN was in town concurrently with other Karloff films, notably THE GUILTY GENERATION and THE PUBLIC DEFENDER.